Twin Planemos Discovered - Universe Galaxies And Stars Section. Artist illustration of twin planemos. Image credit: ESO. Astronomers have turned up plenty of extrasolar planets, but a newly discovered binary pair of planets is quite the find. The system consists of a 7-Jupiter mass planet and a 14-Jupiter mass planet... but no star. 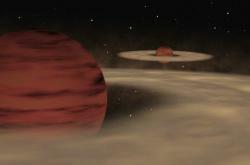 These planets - or “planemos” - just orbit each other. Their discovery challenges the current theory that planets are thought to form out of the disks of gas and dust that surround newborn stars. The cast of exoplanets has an extraordinary new member. Using ESO's telescopes, Astronomers have discovered an approximately seven-Jupiter-mass companion to an object that is itself only twice as hefty. Both objects have masses similar to those of extra-solar giant planets, but they are not in orbit around a star - instead they appear to circle each other. The existence of such a double system puts strong constraints on formation theories of free-floating planetary mass objects. Ray Jayawardhana of the University of Toronto (Canada) and Valentin D. Ivanov of ESO report the discovery in the August 3 issue of Science Express, the rapid online publication service of the journal Science. Roughly half of all Sun-like stars come in pairs. So do about a sixth of brown dwarfs, ‘failed stars' that have less than 75 Jupiter masses and are unable to sustain nuclear fusion in their cores. During the past five years, Astronomers have identified a few dozen of even smaller free-floating planetary mass objects, or planemos, in nearby star forming regions. Oph 162225-240515, or Oph1622 for short, is the first planemo found to be a double. The researchers discovered the companion candidate in an optical image taken with ESO's 3.5-m New Technology telescope at La Silla, Chile. They decided to take optical spectra and infrared images of the pair with ESO's 8.2-m Very Large telescope to make sure that it is a true companion, instead of a foreground or background star that happens to be in the same line of sight. These follow up observations indeed confirmed that both objects are young, at the same distance, and much too cool to be stars. This suggests the two are physically associated. By comparing to widely used theoretical models, Jayawardhana and Ivanov estimate that the companion is about seven times the mass of Jupiter, while the more massive object comes in at about 14 times Jupiter's mass. The newborn pair, barely a million years old, is separated by about six times the distance between the Sun and Pluto, and is located in the Ophiuchus star-forming region approximately 400 light years away. Planets are thought to form out of discs of gas and dust that surround stars, brown dwarfs, and even some free-floating planetary mass objects (see ESO 19/06). But, “it is likely that these planemo twins formed together out of a contracting gas cloud that fragmented, like a miniature stellar binary,” said Jayawardhana. “We are resisting the temptation to call it a ‘double planet' because this pair probably didn't form the way that planets in our solar system did,” added Ivanov. Oph1622B is only the second or third directly imaged planetary mass companion to be confirmed spectroscopically (see ESO 23/04 ), and the first one around a primary that is itself a planetary mass object. What's more, its existence poses a challenge to a popular theoretical scenario, which suggests that brown dwarfs and free-floating planetary mass objects are embryos ejected from multiple proto-star systems. Since the two objects in Oph1622 are so far apart, and only weakly bound to each other by gravity, they would not have survived such a chaotic birth. “Recent discoveries have revealed an amazing diversity of worlds out there. Still, the Oph1622 pair stands out as one of the most intriguing, if not peculiar,” said Jayawardhana. “Now we're curious to find out whether such pairs are common or rare. The answer could shed light on how free-floating planetary-mass objects form,” added Ivanov. : Another serious candidate is the low-mass companion to GQ Lupi, a young T-Tauri star (see ESO PR 09/05). Models lead to a mass for this object between 1 and 42 Jupiter masses.